What kind of collection could possibly find common ground among The Son of Kong , Platoon , and Pink Flamingos ? What kind of fevered minds could conceive of such a list? What are the unheard-of qualities that tie them all together? The answers: This book. The National Society of Film Critics. And the far-reaching enticements of the B movie itself. Once the B movie was the Hollywood stepchild, the underbelly of the double feature. Today it is a more inclusive category, embracing films that fall outside the mainstream by dint of their budgets, their visions, their grit, and occasionally- sometimes essentially- their lack of what the culture cops call"good taste." 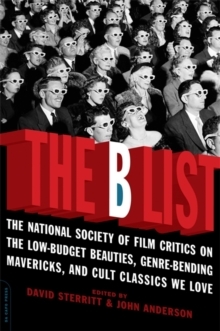 The films in The B List are offbeat, unpredictable, and decidedly idiosyncratic. And that's why we love them.